In this post, I would like to introduce a very handy way to monitor a Java web application's performance, using Jamon (click on the link to get to the Jamon project homepage). There are numerous ways to monitor the performances from a Java web application, but how easy it is set up and what kind of information you need in return, will determine the solution you'll choose. This could go from printing out (or logging) execution time, which has been explicitly calculated (stop time - start time), on the standard exit, to AOP using Spring Aspect or AspectJ. 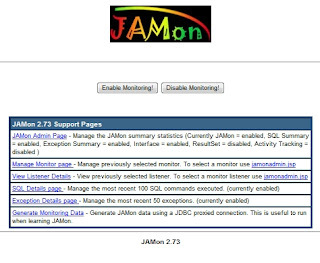 The most interesting feature Jamon provides, is a web application showing you the monitoring's result. 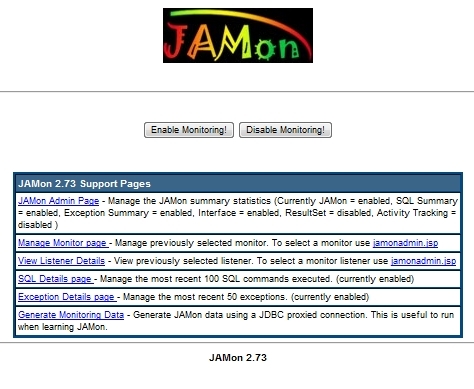 Copy the jamon-2.73.jar library into the classpath of the project for which you want to enable monitoring. Actually, you would rather copy this library to the directory from you web server, that contains the libraries that are shared across all the deployed applications. In my case, as I deployed a sample application on a Tomcat server, I copied the jamon-2.73.jar library into the %TOMCAT_HOME%/lib directory. Also, if you intend to use the provided monitoring console, you should definitely shared the library across all the applications. Deploy the provided monitoring console by copying the jamon.war file from the Jamon distribution to the %TOMCAT_HOME%/webapps directory. As you can see, it's very simple to use Jamon : first, you'll retrieve and start a Monitor object by executing MonitorFactory.start(String label). The "label" argument designates the name under which the code section to monitor will be identified within the monitoring console. At the end of the code section that you're monitoring, just call the stop( ) method on the Monitor object. I've deployed this sample servlet and had it process a few requests (some with the "action" parameter = LOGIN, some otheres with the value CHECKOUT. Among all the infos, you'll have the number of times your monitored code has been executed, the average execution time, the longest/shortest execution time, and so on. That was just a slight overview of Jamon's features, you should definitely take a look at its documentation, as it provides some other monitoring functionalities. hi!! Yiu, great article... It would be great if you could explain it more.Can i use JAMon for implementing the website hitcounter(counting the website hit) please reply..
Hi there, sorry for the belated answer. In my opinion, you don't need Jamon to implement a website hit counter: defining a servlet filter will do the trick. As a matter of fact, in the code samples section of Jamon doc, they're actually defining a class that implements the Filter interface (see http://jamonapi.sourceforge.net/MonitorFilter.html). The advantage of embedding Jamon in an HTTP servlet filter would be that you could enable/disable it at any time, without redeploying you app. On the other hand, you could also consider using web analytic tools such as Google analytics, W3Counter, and so on. Hi,I am trying to develop a tool in java that hosts on tomcat and the pc's that are connected in lan are getting monitored and their usage is getting displayed on the server. Hi could you please provide JAMon configuration instructions for JBOSS7? On the website I see the instructions for JBOSS 4 (http://jamonapi.sourceforge.net/http_monitoring.html), but now there is total change in its folder structure in JBOSS7. Hi there, sorry for the belated answer. Up to this point, I was able to deploy my own web application that uses Jamon API. Unfortunately, I haven't been able to deploy the jamon.war application properly yet. As a matter of fact, I guess we'd neet to retrieve its sources, define the manifest.mf with the neccessary dependencies and repackage as .war and deploy it. Hope that might help you.